Gustafson Guthrie Nichol (GGN) is pleased to announce the beginning of construction of the CityCenterDC development by Hines|Archstone in downtown Washington D.C. A new mixed-use development located on the 10-acre site of the former convention center, CityCenterDC is one of the largest downtown development projects currently underway in any U.S. city. Gustafson Guthrie Nichol participated in developing the master plan for the site with lead architect Foster + Partners, and acted as lead landscape architect, working with DC-based Lee and Associates. Additional members of the design team include DC-based Shalom Baranes Associates, serving as associate master plan architect, project Architect of Record, and lead designer of the residential rental buildings. Construction commenced on March 23, 2011, and is expected to reach completion by the fourth quarter of 2013. The project includes the development of Northwest Park, a lively addition to downtown DC, the creation of a Central Plaza, as well as dramatic terraces with green roofs and gardens incorporated into all the buildings. “In addition to creating a major new residential and retail hub, CityCenterDC will create a pedestrian-friendly neighborhood, with park and walkways, and is expected to emerge as a new destination in downtown DC”, says Kathryn Gustafson, lead designer and partner at GGN. “We are thrilled to be part of such an esteemed team of designers”. Three key principles guided the design of the new public spaces within CityCenterDC: (i) connecting to the City by reinstating I Street and 10th Street thereby extending the urban fabric of the city through the city and restoring L’Enfant’s Plan, (ii) integrating into the neighborhood by incorporating small pedestrian alleyways with limited vehicular access and (iii) creating an inviting and exceptional destination featuring signature retail and dining establishments, engaging public spaces with seasonal programming, and a mix of housing opportunities. The project re-introduces the original street grid of Washington’s L’Enfant plan as a framework for a pedestrian-oriented, vibrant, mixed-use neighborhood that connects into the surrounding city fabric and continues the revitalization of this city sector. Signature elements of the CityCenterDC development include Northwest Park and Central Plaza, both designed by GGN. Northwest Park will be an elegant and lively addition to downtown DC. It responds to the site’s critical location along New York Avenue by creating a direct connection to Mount Vernon Square and the White House. The centerpiece of Northwest Park are a pair of fountains which frame the experience of entering the park with the sound of rushing water and a controlled perspective view of the new neighborhood and the entrance to Central Plaza. On either side of the fountains, two areas provide a variety of seating options under a generous canopy of trees surrounded by a mixture of formal hedges. From Northwest Park, visitors will be welcomed into the heart of CityCenterDC’s Central Plaza. The Central Plaza is envisioned as the ‘living room’ of the larger neighborhood, a public space where people can sit at cafes, meet friends and relax. It is a dynamic composition of trees, clipped flowering hedges, seating and fountains designed to give the space a sense of longevity and permanence despite being surrounded by two stories of stores and restaurants, the plaza will have a public feel and will be enlivened by a program of year-round events that take advantage of the design’s ability to accommodate a wide range of flexible uses. In addition to these street level amenities, dramatic terraces with green roofs and gardens are incorporated into all the buildings of CityCenterDC, contributing to the visual experience of passers-by as well as of building residents. CityCenterDC will be a bustling urban center with a diverse network of open spaces that contribute to the continued rebirth of Washington DC as a vibrant city. In November 2003, a team led by Hines and Archstone was selected by the District of Columbia to master plan and execute the redevelopment of the “Old Convention Center Redevelopment Site,” a 10-acre parcel in the middle of downtown Washington, DC. The project is situated in the heart of downtown’s office core, along a ceremonial stretch of New York Avenue between the new D.C. Convention Center and the U.S. Treasury and White House. The two busiest stations in the Metrorail system, providing service on all lines, are located within two blocks of the site. Site access to and from other parts of the District, Northern Virginia and Maryland is excellent. The overall objective of the project is to create a unique, pedestrian-friendly, mixed-use urban neighborhood that includes retail, entertainment, residential and office uses, as well as programmable public space. Hines, Archstone and their District-based developer partners, are committed to creating a place that is first and foremost for the District and its residents, and that will appeal to downtown workers and visitors. The development team will also strive to create a great place for people, with the highest quality and innovation in urban design and architecture. Visit www.citycenterdc.com for more information. Gustafson Guthrie Nichol (GGN) is a landscape architecture practice based in Seattle, Washington. Founded by partners Kathryn Gustafson, Jennifer Guthrie, and Shannon Nichol, GGN works throughout the Americas and Asia. Its projects are developed by designers with professional backgrounds in landscape, architecture, engineering, graphics, ecology, and other sciences, express the sculptural qualities of contextual landscape. GGN offers special experience in designing high-use landscapes in complex, urban contexts. GGN’s landscapes are widely varied in type and scale, but they share qualities as healthy settings for diverse and ever-changing activities. The landform of each space is carefully shaped to feel serenely grounded in its context and comfortable at all times — whether bustling with crowds, offering moments of contemplation, or doing both at once. GGN’s recent project awards include multiple ASLA National Design Excellence Awards, Tucker Architectural Awards, and AIA/ASLA Honor and Merit awards for Design. GGN’s prominent projects include the Lurie Garden of Millennium Park in Chicago, the Robert and Arlene Kogod Courtyard at the Smithsonian American Art Museum and National Portrait Gallery in Washington, DC, and the new Bill and Melinda Gates Foundation Campus in Seattle. Kathryn Gustafson is also a partner in the UK design firm, Gustafson Porter. 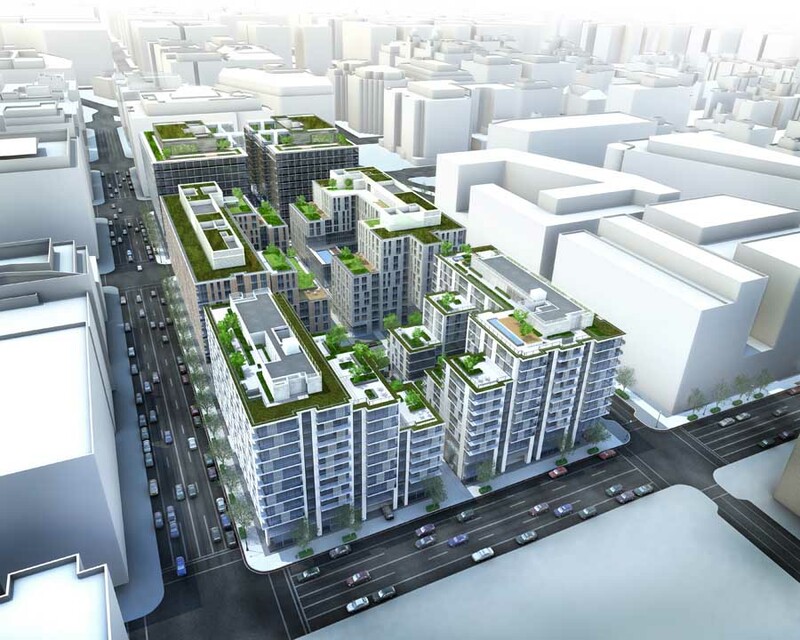 CityCenter DC, a new mixed-use low carbon masterplan on the ten-acre site of the former Old Convention Center in Washington DC started construction this week. It is one of the largest urban redevelopments in the USA. Foster + Partners has designed four new buildings in addition to the masterplan, which brings together hotels, offices, apartments, restaurants and a wide range of shops.